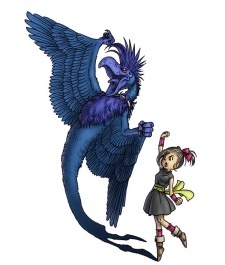 Kluke is the owner of the shadow Phoenix, who often uses black magic attacks. In the anime, Kluke does not receive Phoenix until late into the story and therefore stays out of combat. Phoenix has a kind motherly side to her that teaches Kluke how to protect her friends. Besides using various barriers in battle, Phoenix also has the ability to teleport.